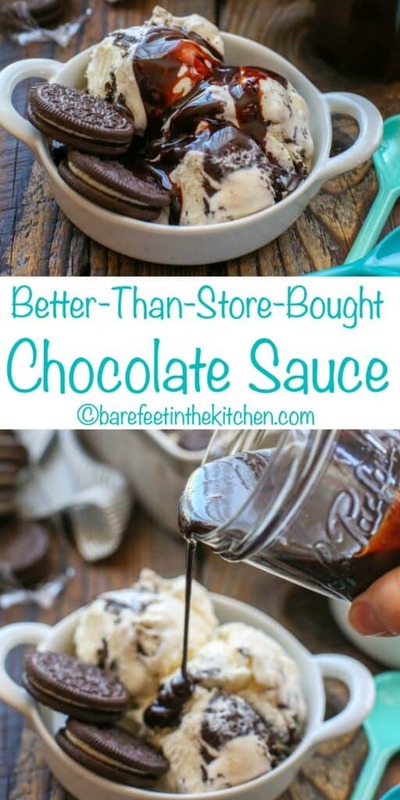 You only need a few ingredients to make this Homemade Chocolate Sauce and it tastes better than any chocolate syrup you can buy at the store. Smooth, sweet, and incredibly chocolate-y, this is the chocolate sauce I tried for years to make. 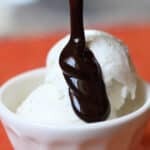 I wanted a simple homemade chocolate syrup similar to Hershey’s syrup; something that I could use to make chocolate milk for my boys or use as an ice cream topping. Over the past few years, I’ve made numerous chocolate sauces: rich creamy hot fudge sauces and basic melted chocolate sauces (i.e. Homemade Magic Shell). I ran across this recipe many years ago and tried it within a few days of finding the recipe. This was exactly the chocolate sauce what I wanted! 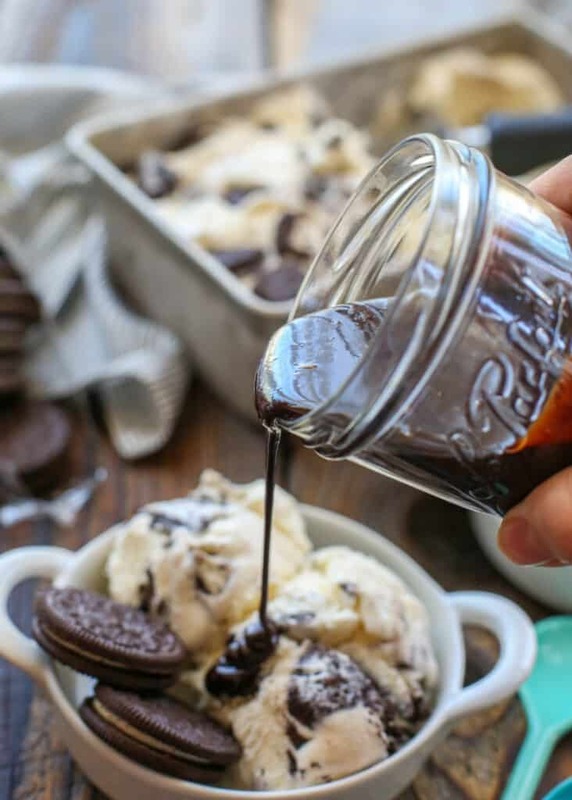 This chocolate sauce is not overly sweet and it is smooth and rich in flavor. This is better than the Hershey’s syrup that I remember. I am excited to have this in the refrigerator now and I can hardly wait to make a treat with it after dinner tonight! When I found this recipe for homemade chocolate sauce, it was almost too simple to believe. No fancy ingredients, no dairy, just sugar, cocoa powder, and water. A pinch of salt and a tiny splash of vanilla finish it off perfectly. This sauce tastes like Hershey’s syrup, only better. 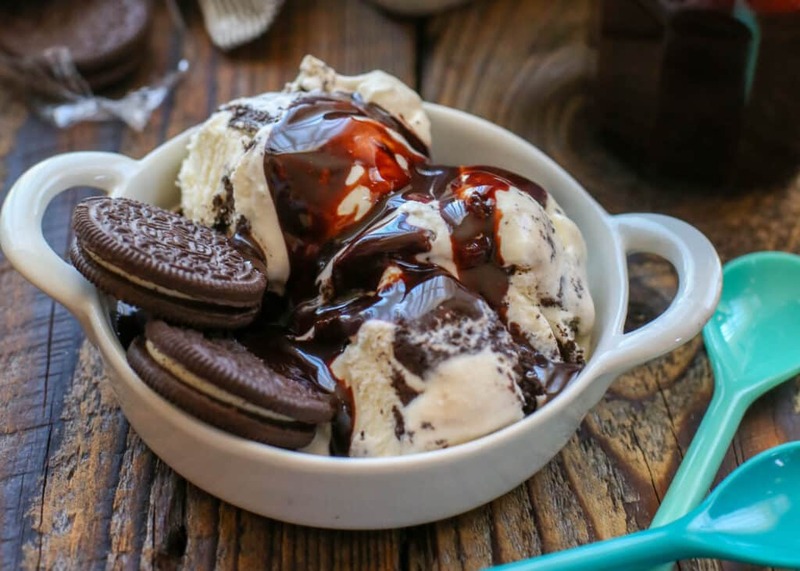 Pour chocolate sauce over the best and easiest Homemade Vanilla Ice Cream, Cherry Ice Cream, or Salted Caramel Ice Cream. This Peanut Butter Ice Cream by Pint Sized Baker is begging for some chocolate sauce and I can’t wait to drizzle some chocolate sauce over this Take 5 Ice Cream Pie by Beyond Frosting. 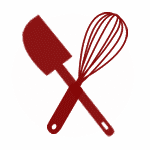 In a cold saucepan, whisk together the cocoa and the sugar until all lumps are removed. Add the salt and the water and bring to a boil over medium to medium-high heat. Reduce to a simmer; stirring constantly. Simmer for about 30 seconds and then remove from heat. Let cool and then add vanilla. Pour into a glass jar and refrigerate until needed. In a cold saucepan, whisk together the cocoa and the sugar until all lumps are removed. Add the salt and the water and bring to a boil over medium to medium high heat. Reduce to a simmer; stirring constantly. Simmer for about 30 seconds and then remove from heat. Let cool and then add vanilla. Pour into a glass jar and refrigerate until needed. Enjoy! The chocolate sauce will be very thin when it finishes boiling, but it will thicken quite a bit as it cools. The chocolate sauce may be stored in the refrigerator for up to two weeks. Simply reheat before serving. This recipe makes 14oz of chocolate sauce and can easily be doubled if desired. I'm all over this, choco-holic that I am! This looks AWESOME!! How long do you suppose this will last? I'd be fine with keeping it for at least a month. Ours has never lasted that long though! I wonder how it would be in a glass of cold milk??? I think Ill try that lol. It was the first thing on my mind and the first thing I did! LOL FYI, ITS BETTER THAN THE BRAND NAME AT YOUR LOCAL MARKET! URSHEZE I think? I know!!!! Lol. Trust me it's that good! Is reheating necessary? Is it okay to take out of refrigerator and use immediately? It will be very thick after being refrigerated. You could set it out on the counter, but I have no idea how long it might take to become pourable again. I used mine straight out of the fridge this morning and it was fine! I'm so glad you like it, Megan! This is really delicious, simple, and easy to make. It has a nice texture/thickness for ice cream, cake drizzle or for brownies. I had been looking for a great tasting chocolate syrup to avoid the corn syrup based retail products. Also an advantage that this does not have dairy and dissolves nicely to make a shake or chocolate milk. I think I might make some and give in pretty jars for Christmas. I used a good dark cocoa and the taste was better than name brand syrups from the store. Thanks for sharing this recipe. I found it to be thick and very powdery. I think the amount of cocoa powder is making it powdery. Did the cocoa powder not dissolve completely? It shouldn't be powdery at all. Why would this only last 2-4 weeks in the fridge? Seems like, given the ingredients list, it would have an extremely long shelf life?Anyone have any thoughts on that? If you scroll down to the bottom of the post, it's there. I make mine right in the jar! First, make a simple syrup. Put your jar with the water in the MW to heat it. Use a large enough jar so the water only comes up halfway. It only has to get hot enough so the cocoa will dissolve. Add some of the cocoa and shake. Do this for the remaining cocoa then sweeten with the simple syrup. I've never tried doing that, Gabby. It's worth trying. Because of the high sugar content, it will keep for an incredibly long time in the fridge. Like years. You shouldn't have a problem freezing it, either, but it will make it difficult to use since you'll need to heat it before using it. This is the homemade best chocolate sauce and was just as quick and easy as the instructions say! It came out just thick enough with just the right amount of sweetness. I can even share this with my lactose intolorent friends. Thank you for sharing. I am thrilled that you are enjoying the chocolate sauce, Christy! Love the simplicity of this sauce and the consistency is perfect, even straight out of the refrigerator. It's almost too rich for my taste though - next time I'll use dark cocoa and less sugar too. Very decadent and delicious! I'm glad you're enjoying the chocolate sauce, Megan!